OK, two things to say quickly. One, this appears to be an amazing use of mobile technology. Two, it won’t make you any better at golf. Or should I say probably won’t in case we get into any trouble legally. It’s just I have a particularly keen memory of how faith in golf technologies, and little dimpled amateurs who pose as golf teachers because they can’t make it as professionals, can end up costing a lot of money and time. Yes, I once thought I could be good at golf. Not once. About 37 times. From the ages of 13 to 24. The prime of my life. All gone because I used to hang around driving ranges hitting so many yellow balls into the dark that I had to sit in front of the television holding bags of frozen vegetables to soothe my blisters. Anyway, enough confessions. If you’ve ever had a ‘video’ golf lesson (and I can tell you a few things about the hours I’ve spent on video golf lessons) you’ll know about swing analysis. Well now using Pro Session Golf (available for Nokia N95, N93i, N93, or N73) one thing you don’t need is a teacher. Although if you don’t know anything about swing analysis it might be worth buying a few books. Because this is a little complicated. The software allows you to record your swing; you do need someone to film you. 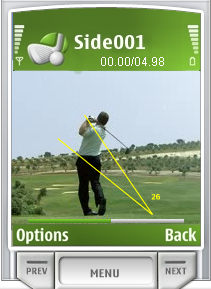 Then by measuring the angles of trajectory and comparing two different swings in split-screen mode you can quickly see how you need to alter your upswing, downswing, hip swivel, weight transfer or whatever else is going wrong. Probably all of it. The software allows pausing, frame-by-frame playback, rewind and fast forward as well as selecting and marking any point of the swing. I have to say it looks amazing, but I suggest you don’t play around with it until you know what you’re doing. Either that or just give the game up completely. That worked for me.